Just to give an idea, a true armoured door cannot cost less than 1,500/2,000 Euros. In addition, in order to be fully effective, an armoured door must be fitted to perfection, so that it cannot be easily knocked out of the wall, especially if you are dealing with walls which are not very strong, such as those in many properties built in previous decades. They add a lock to the one already installed on the door, thus doubling the effort needed to open it by lock picking. They increase the locking points which obstruct break-in attempts. Anchored in the walls and/or in the floor, they keep the door in position even during an attempt to unhinge it. There are various types of locking bars: fixed or adjustable, mechanical or electronic, for horizontal or vertical installation, which are all useful for reinforcing the door. Let’s look at them in detail. It is installed horizontally, selecting the size of the locking bar according to the width of the door. The Viro Fixed Locking Bar provides an extremely high resistance to bending and the action of a lock pick: the dead-bolt engages in clamps built into or fastened to fittings in the wall, offering protection against break-in and unhinging attempts. The clamps are fixed from the inside and are therefore particularly difficult to remove from the outside. It is operated by a special round cylinder with 7 pins, and is reinforced externally by a burglar-resistant and anti-drill protection. The Viro Fixed Locking Bar is operated by a special round cylinder with 7 pins. The photo shows a pair of cylinders with Palladium punched keys. 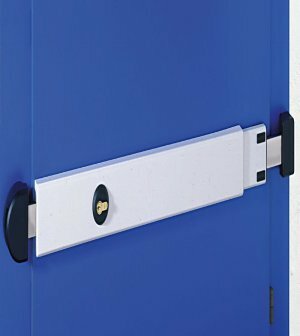 The Viro Adjustable Locking Bar has the same high security features as the fixed one, plus the ability to adapt easily to different doors widths, of between 73 and 98 cm. It also has an effective anti-attack device, activated by a single throw, allowing the door to be half opened whilst communicating with the outside in complete safety. It is operated by a European profile cylinder with 7 pins having a special length (interchangeable with any European profile cylinder), and is reinforced externally by a burglar-resistant and anti-drill protection. The Viro Adjustable Locking Bar fits doors with a width of between 73 and 98 cm. The Universal Mechanical Locking Bar can be installed on all types of entrances (doors, shutters, French Windows, skylights, etc. ), both horizontally and vertically; it can be shortened by a simple operation to the desired size (down to 65 cm) or extended by using a special kit (up more than 4 m, such as for up-and-over garage door or shutters) and can be operated by any European profile cylinder. The cylinder can be armoured with a burglar-proof and anti-drill security escutcheon supplied. The Viro Universal Locking Bar can use any European profile cylinder, which can be armoured with a security escutcheon supplied. The Universal Electronic Locking Bar combines all the security features of the mechanical version with an anti-intrusion vibration sensor, a GSM phone dialler and a room security microphone. By simply inserting a SIM card and storing in it emergency contact numbers in the event of an attempted burglary, the electronic module inside the locking bar detects any break-in attempts, sends an alarm SMS to all the preset numbers and also makes a call to the first registered number. To assess whether or not an attempted burglary is in progress, the locking bolt allows remote listening, in real time, to what is happening in the room in which it is installed. The Viro Universal Electronic Locking Bar has an anti-intrusion vibration sensor, a GSM phone dialler and a room security microphone. To achieve even greater security, the locking bars can even be installed in pairs, by positioning them horizontally at the top and bottom on the door (Fixed, Adjustable and Universal Locking Bars) or vertically (Universal Bars). The presence of a further lock gives the additional benefit of allowing a differentiated management of keys. For example, if a cleaner or other workers must enter the house you can close just one of the 2 locking bars and give the individuals in question only the relative key, whilst closing both locking bars when you do not want to allow access. 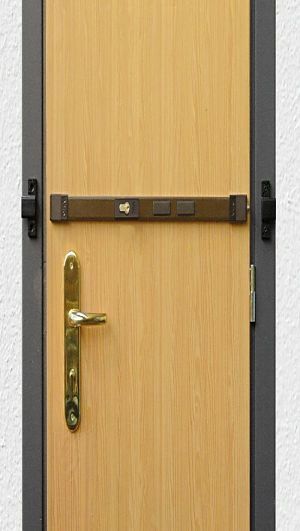 The cost of a mechanical locking bar, or even a pair, is less than the cost of purchasing and installing an armoured door, even a poor quality one, whilst the overall result in terms of security is at least comparableto that of a top class armoured door, which is certified simply to resist the physical force of someone attempting to open it, and nothing more. 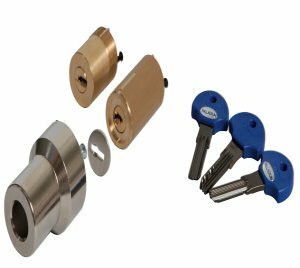 The result may even be bettersince with the locking bar combined with the correct cylinder there is also an improvement in the resistance to withstand lock picking or key bumping. If we consider the possibility of combining, in a limited space and without wiring, the mechanical resistance and theft prevention offered by the integrated alarm, in the electronic version, it is easy to understand how a good quality locking bar can offer excellent security without having to change the existing door.